Lane Pederson Psy.D, LP, has provided Dialectical Behavior Therapy (DBT) training and consultation to over 10,000 professionals in the United States, Australia, South Africa, Dubai, Canada, and Mexico through his training and consultation company, Lane Pederson and Associates, LLC (www.DrLanePederson.com). A real world practitioner, Dr. Pederson co-owns Mental Health Systems, PC (MHS), one of the largest DBT-specialized practices in the United States with four clinic locations in Minnesota (www.mhs-dbt.com). At MHS Dr. Pederson has developed DBT programs for adolescents, adults, people with dual disorders, and people with developmental disabilities. He has served as clinical and training directors, has directed practice-based clinical outcome studies, and has overseen the care of thousands of clients in need of intensive outpatient services. 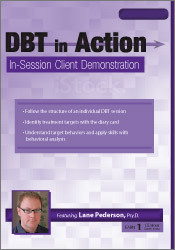 Dr. Pederson’s DBT publications include The Expanded Dialectical Behavior Therapy Skills Training Manual, 2nd Edition: DBT for Self-Help and Individual & Group Treatment Settings (PESI, 2017); Dialectical Behavior Therapy: A Contemporary Guide for Practitioners (Wiley, 2015); Dialectical Behavior Therapy Skills Training for Integrated Dual Disorder Treatment Settings (PESI, 2013) and The DBT Deck for Clients and Therapists: 101 Mindful Practices to Manage Distress, Regulate Emotions & Build Better Relationships (PESI, 2019). Notable organizations he has trained for include Walter Reed National Military Hospital, the Federal Bureau of Prisons, the Ontario Psychological Association, the Omid Foundation, and Psychotherapy Networker. He has provided DBT training for community mental health agencies, chemical dependency treatment centers, hospital and residential care settings, and to therapists in forensic settings. Dr. Pederson also co-owns Acacia Therapy and Health Training (www.AcaciaTraining.co.za) in South Africa. Dr. Pederson currently serves on the advisory board for the doctorial counseling program at Saint Mary’s University of Minnesota and is a peer reviewer for Forensic Scholars Today. Lane Pederson is not affiliated or associated with Marsha M. Linehan, PhD, ABPP, or her organization. Financial: Lane Pederson maintains a private practice. He is an author for PESI Publishing & Media and receives royalties. Dr. Pederson receives a speaking honorarium from PESI, Inc. Non-financial: Lane Pederson has no relevant non-financial relationship to disclose. 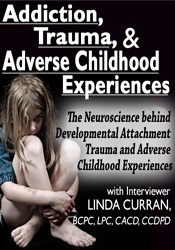 Addiction, Trauma, & Adverse Childhood Experiences (ACEs): The Neuroscience behind Developmental/Attachment Trauma and Adverse Childhood Experiences.